ADEQ’s Operator Certification Program establishes guidelines to ensure that only certified operators make decisions about process control or system integrity that affects public health. The program establishes minimum standards for certification and recertification of the operators of drinking water and wastewater systems. A certified operator is an individual who holds a current certificate issued by ADEQ in the field of water or wastewater treatment, water distribution, or wastewater collection. All water and wastewater facilities require an operator in direct charge who is certified for the class of the facility at or above the grade of the facility. Facility owners need to ensure that all current operators working in their facility are on file with ADEQ. Grade 3 & 4 facilities require an on-site operator. Grade 1 & 2 facilities require an on-site representative. Grade 1 distribution facilities, serving fewer than 100 people, do not need an on-site representative. How Do I Become A Certified Operator? To become a certified operator, you will need to take the Operator Certification Examination. 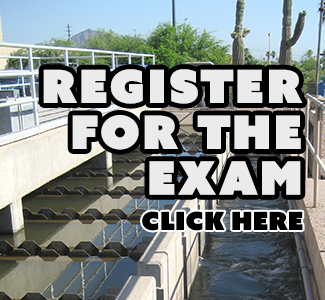 No work experience at a water or wastewater facility is required to complete an operator certification exam in Arizona. To sit for a Grade 1 exam, you must have a high school diploma or GED. Operators must hold the lower-grade-level certificate for one full year (365 days from the effective date), prior to sitting for the next grade level. To check the effective date of the certificate(s), use the Operator Certification Database (see sidebar). Testing early (before 365 days from your effective date) requires ADEQ approval prior to sitting for the exam. Use the Operator Certification Early Exam Application to begin the review process. To start testing at Grade 2 or higher, qualifying education and work experience is required. Please contact the Operator Certification Program for more details. If you recently passed an operator certification exam from Gateway Community College or received reciprocity from ADEQ, you will need to fill out the Operator Certification New Certificate Application form (see sidebar). If you took the exam from Gateway Community College, you'll need to include the Individual Mastery Report (IMR) that you received from the Association of Boards of Certification (ABC) via email (a printout showing your first and last name along with the exam breakdown and passing score). New certificates will not be issued until the application, IMR (if applicable) and fee(s) have been received by ADEQ. The Operator Certification Program hosts free workshops throughout the year (see sidebar). All operators, stakeholders and community members are welcome to attend and participate. Professional Development Hours (PDHs) will be awarded at all workshops.